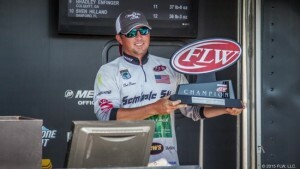 Clint Brown of Bainbridge, Ga. won the FLW Rayovac bass fishing tournament on Lake Seminole, held May 22-24. BAINBRIDGE, Ga. (Feb. 20, 2018) – As many as 400 pros and co-anglers are set to compete in the Costa FLW Series Southeastern Division event at Lake Seminole presented by T-H Marine, March 1-3. The tournament, hosted by the Bainbridge Convention and Visitors Bureau, is the second of three regular-season events scheduled in the FLW Series Southeastern Division. Anglers will be competing for a top award of up to $93,000, including a brand new Ranger Z518C boat with a 200-horsepower Evinrude outboard.